As you may have heard, Friday marks “Wear Your Favorite Hockey Jersey Day” for Hockey Weekend Across America. It’s a fun and easy way to take part in the weekend and indirectly promote the game of hockey where ever you wear your jersey. The hockey jersey is easily the greatest piece of fabric in all of sports. Is it really even an argument? You can’t tell me the Chicago Blackhawks logo isn’t the best in all of sports or that the Spoked-B or Winged Wheel are right up there. There’s something classy about a hockey jersey. The fact of the matter is, no other sport features its primary logo on a uniform as prominently as hockey does. The jersey is one of the great symbols of the team-first culture that endears hockey to so many fans. In what other sport is the jersey held in similar regard to the American or Canadian flag? Don’t step on the crest, logo out on the locker stall, don’t ever let that jersey hit the floor. Jerseys and logos have changed over the years, but many have stayed the same. The logo on the front connects Jonathan Toews to Bobby Hull, Zdeno Chara to Bobby Orr, Wayne Gretzky to Taylor Hall, Mike Bossy to John Tavares and Pavel Datsyuk to Gordie Howe. Players come and go, but the jersey remains. The memories remain. Thankfully, a lot of NHL teams are going back to their classic logos and looks. Curse you 1990s for making people think they had to “modernize“. Perhaps the most egregious of all jerseys is to the left (thankfully, it was only a third jersey). 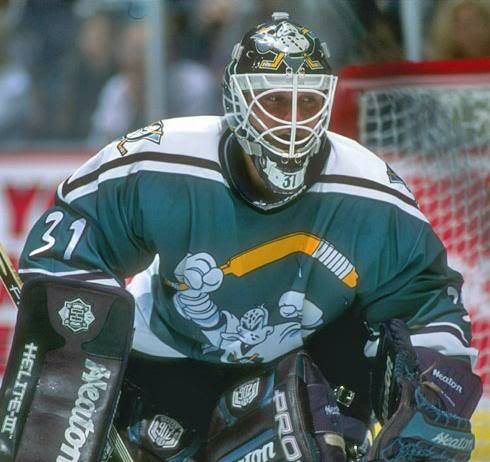 You can’t blame NHL teams for experimenting (though the “Wild Wing” Ducks jersey is still unfathomable). Hockey fans love buying hockey jerseys. It’s just a fact. Why shouldn’t we? There’s no better way to show team pride, or love of the game than wearing a jersey. I hope more teams continue to realize that building tradition with one logo tends to work and people will keep buying those jerseys and T-shirts and hats. Pardon me while I dismount from my soap box, I’m a bit of a tradition freak. Even though the jerseys and logos do occasionally change, our allegiances don’t. Hockey fans are a loyal breed. Since we are a loyal breed, we must wear our team’s colors. While the hockey jersey doesn’t necessarily make the best fashion statement with a pair of jeans and sneakers, putting it on instantly connects us with our favorite players and our fondest memories. I’m willing to bet you remember the first hockey jersey you ever put on. It might have been your youth team’s jersey or your favorite pro club. No matter what, you never forget the first time you pulled a hockey jersey over your head. My first jersey was a blue Edmonton Oilers jersey my dad bought from the Homewood-Flossmoor Ice Arena in the early 90s. No name or number on the back. I’ll never forget it and it is still in a closet in my parents house. I still have no idea why I wanted an Oilers jersey, but I definitely remember pulling that blue beauty out of the closet, throwing it on and heading to the basement for some wrist shots against a wall (sorry, mom and dad). That jersey is part of my childhood. The hockey jersey is so much more than a piece of clothing. It’s part of our game, it’s part of our history, it’s simply part of us. I had initially planned to share a few more stories about my personal experience with hockey jerseys. However, when I posed a few jersey-related questions on Twitter, I realized that reading your thoughts was way more fun. As I learned through reading people’s answers on Twitter, hockey jerseys have such different meanings to people. So, let’s hear what hockey jerseys mean to you. What was the first jersey you ever owned? If you could have any jersey in the world, what would it be? What’s your favorite jersey of all time? What was your first youth hockey number? I mean, we can go on and on. Whatever you feel about the hockey jersey, I want to hear it. The biggest reason I started this blog was to help inform fellow hockey fans, but also to stoke conversation and encourage interaction. So I want to hear from you. Make sure to leave your answers in the comments. It’s a fun topic, so chime in! Don’t forget to wear your favorite jersey tomorrow and show your hockey pride. Coming up on Friday, I’ll celebrate my hockey hero and share some more HWAA-related links. This entry was posted in Hockey Weekend Across America. Bookmark the permalink. One of the jersey’s I’d love to have is the UW Badgers from the year they did the outdoor game up at Lambeau. Those were tight. I’d also love to have a UND sweater from the Belfour days, when they were basically just green Korean knock-offs of the Blackhawks’ jerseys. The more I think about this, the more jerseys I want. I’m going to have to stop while I’m ahead! You’re from homewood-flossmoor? My grandparents lived there their entire lives, and we would play the H-F Vikings a few times every season and in the playoffs before they rearranged the league. It’s good to know a fellow southsider runs one of my favorite blogs. Thanks for the kind words, Josh. I’m really glad you enjoy the blog. I’m actually from the Chicago neighborhood of Mt. Greenwood. So, yes I am a South Sider, but I didn’t live in H-F. I did play most of my youth hockey there and played for Mt. Carmel, so H-F Ice Arena was basically my home away from home for much of my formative years. This is a great blog about hockey. -my first jersey I ever had was a white Red Wings jersey that my dad got for me when I was in 4th grade, has since been passed down to my 5 yr old nephew. -Any jersey in the world would have to be my high school state championship jersey which was cut off in the hospital after having my neck broken with less than a minute left in the game. -favorite jersey is the classic Wings logo from the days of Howe. -91 was my first and only number I wanted to be like Fedorov as a kid and its also my birth year so has a lot of meaning to me. Highland Park, IL… I’ve heard of H-F and Mt. Carmel’s teams. You guys would have KILLED us. My first jersey was a nylon P.O.S. that I got at a Bar Mitzvah when I was 13 (I’m 35 now). It was red and basically a light mesh, penny-like material. Wore it to my first Blackhawks game, though. After that, I got a red and white replica jerseys (no name or number) and wore those to high school *every* Hawks game day. Home game? White. Away game? Red (yes, back in the day that’s what they wore – colors were away, white was home). Paired with with my Hawks’ hat that I wore 24-7. Needless to say, those jerseys got beat up real quick. Got lots of jerseys over the years… U of IL white, Anaheim Ducks white, Southeastern Connecticut Seahawks blue, Blackhawks white (with Chelios 7), Russian Republic Red (Khabibulin 35 – in Cyrillic! ), Houston Aeros green (older jersey with the bomber), Chicago Wolves St. Patrick’s Day alternate green, USA Olympic (I believe 2002) authentic white and various Bauer, CCM and other such practice jerseys… Hell, I even MADE a few jerseys because I wanted to be in marketing and make that my career. I put my number (30 at the time) on the U of IL and Ducks and I put 41 on the Aeros. I want to get my name/number on the USA and the Wolves St. Patricks,.. I honestly can say that nothing feels as comfortable to me than a hockey jersey. Shame I missed last year’s “Wear Your Favorite Hockey Jersey Day,” but since it might be coming up again, I can probably catch it this year. Best part is, I work in an environment where wearing a jersey (especially that of the Wolves) would be welcomed. Keep up the blog…maybe throw in some pics?